Kitec® is a brand of brass plumbing fitting that was recalled in 2005 by its manufacturer, IPEX, due to its tendency to quickly corrode. The fitting was widely installed throughout the western United States since the early 1990s. Kitec® was originally marketed as a corrosion-resistant alternative to fittings made from copper. IPEX manufactured the fittings with a high percentage of zinc, making them vulnerable to corrosion in a process known as dezincification. As water goes through the fittings, it corrodes the metal, and zinc leaches from the brass and creates a powdery buildup inside the fittings. This buildup can weaken the fitting, restrict water flow and, in the worst-case scenario, cause the pipe to leak or burst. Some homeowners have returned to their homes after being away for several days to find it flooded, requiring tens of thousands of dollars to replace carpet, drywall and furniture. Even small leaks, especially if they are hidden behind drywall, can lead to the growth of mold, which itself is a dangerous condition. Replacing these fittings usually requires cutting into the walls and replumbing the entire house, which costs between $6,000 to $8,000, on average, although it can cost several times this amount. These costs are often paid out of pocket, as some insurers do not cover repairs to items that were recalled. Many insurers that will cover the repairs will require sizable deductibles and increased rates. Kitec’s® Canadian manufacturer, as well as home building companies and plumbing contractors that installed Kitec® fittings, have been the target of a series of massive class-action lawsuits. More than 31,000 homeowners in southern Nevada sued IPEX in 2006 and received a $90 million settlement. Roughly 30,000 homeowners in New Mexico united to file claims as well, and California is likely to follow suit, once the scope of the problem is better understood. Builders and plumbers who installed the product have also been targeted. Nevada builder Del Webb was recently ordered to pay more than $27 million to homeowners in that state. The purpose of these lawsuits is to force the defendants to replace the Kitec® fittings and compensate homeowners who already paid to have them replaced. The exact number of homes with Kitec® water pipe fittings is difficult, if not impossible, to pinpoint. Many homes will have low water pressure but never know why. Based on the lawsuits that have been filed, it seems that at least 60,000 homes in southern Nevada and New Mexico have Kitec® fittings. In addition, it is likely that tens of thousands of homes across the southwest, notably in Tucson and Maricopa County in Arizona, in Sacramento and Los Angeles, and in parts of Texas, have Kitec® fittings. Identification of Kitec® plumbing must be performed by a qualified plumber. The plumber will bore small holes beneath sinks, then insert an instrument with a flexible arm to help identify the fittings. InterNACHI inspectors may be able to identify Kitec® by a yellow or neon sticker on or inside the electrical box. Inspectors and plumbers should beware, however, that stickers were sometimes used indiscriminately to warn of non-metallic plumbing systems other than Kitec®. Therefore, it is possible that a home has no Kitec® fittings even if there is a Kitec® sticker in the electrical panel box. Similarly, many homes that contain Kitec® plumbing do not have stickers in their electrical panel boxes. Also, Kitec® PEX pipes may have the "Kitec" label. 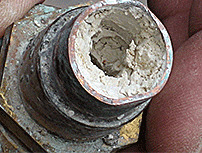 In summary, defective fittings were installed for many years throughout the American southwest, leading to class-action lawsuits. The fittings can be identified in several ways but only a qualified plumber can say with certainty if they are Kitec®. Hi it is very interesting to told you that some people use the small dogs beds for their large dogs and after some days the dogs not feeling well and its health goes down. so from avoiding this we must use dog beds extra large for our large dogs.